Hi! How are you? I’m fine. Yes, it’s been a while and I’m really sorry. Sometimes I get busy with life and that’s exactly what happened with the month of February. I wasn’t able to blog as much as I wanted to. 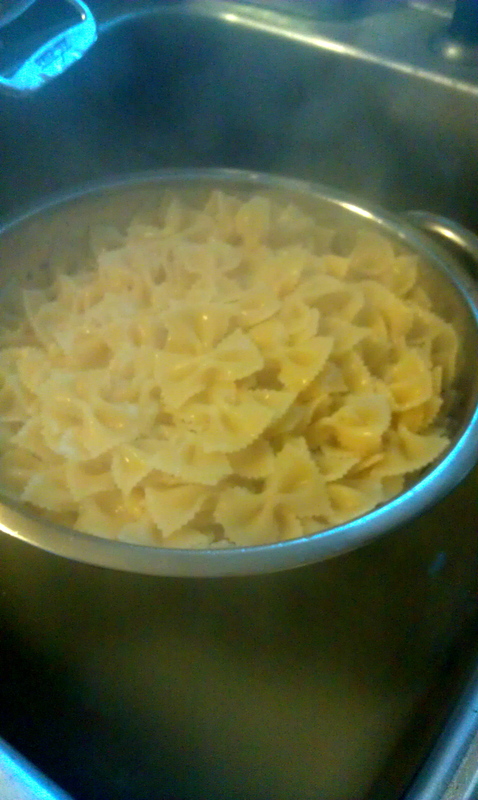 I cooked! I have a back log of posts, but I just couldn’t find the time to sit down and tell you all the things I’ve been doing. And for that, I am terribly sorry! But here’s hoping my unplanned ‘break’ ( I wouldn’t really call it a break, I still facebooked…) got me out of the blogging rut. Enough apologizing, on to the post. And what a post this is! Jes and I have started a birthday tradition for Mom. Last year for her birthday we made delicious steaks and sides. 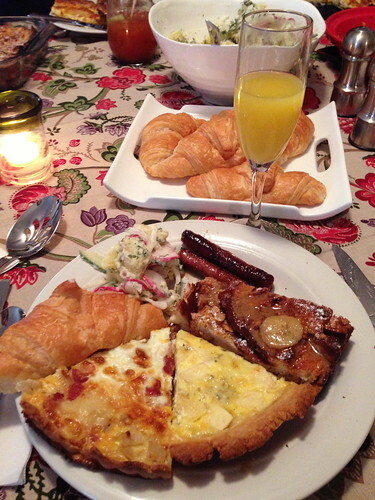 This year we went with brunch. And you know, after two years it’s tradition. So now it’s tradition. Let’s not wait any longer for the festivities. I am in love with the cookbook Around My French Table by Dorie Greenspan. I made it a new years resolution to do more with the group French Fridays with Dorie (FFwD). I think I participated in two recipe postings before I fell off the wagon. I have browsed this cookbook numerous times, flagging different recipes I wanted to make, what’s coming up in FFwD, and just staring at the mouth watering photos in the book. The quiches really caught my eye. When Jes and I started to plan out Mom’s birthday brunch, I thought OMG. I can make Dorie’s quiches. And Boozy Birthday Brunch was decided upon. Before I get into the quiches, Jes made Baked French Toast (Jes: Modifications: I only had walnuts on hand to put between the bread layers, and only had vanilla on hand so it wasn’t really boozy. Maybe next time. 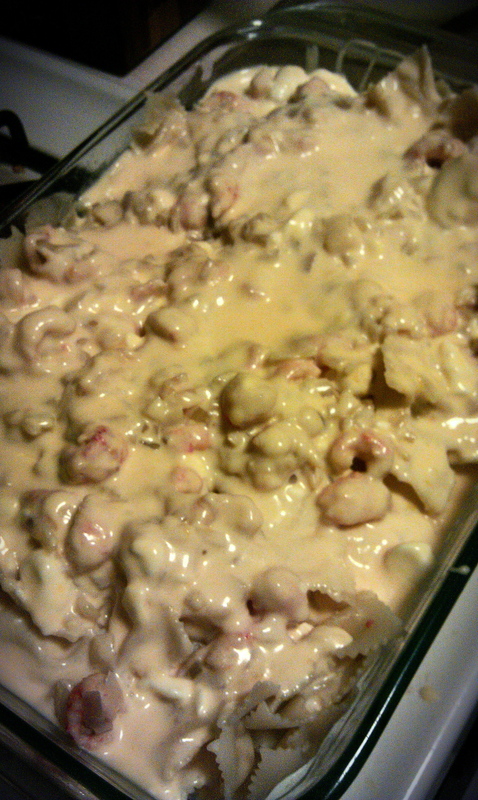 ), Potato Salad (Jes: No modifications. Only that the cucumbers didn’t sit over night, they sat marinating for like a 1/2 hour lol. ), and Caramel Banana Sauce (Jes: No modifications, borgborgborg!) We have at thing with the Sweedish Chef. ON TO THE QUICHES! 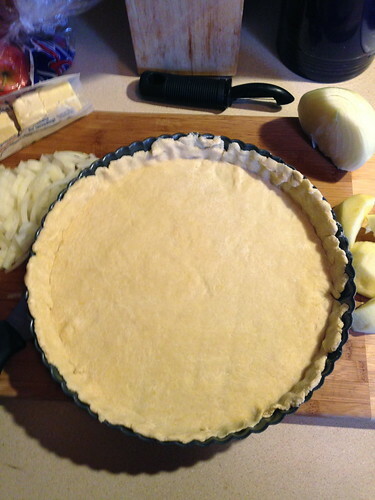 The quiche dough was SIMPLE. Flour, some sugar, some salt, cold butter, an egg. Whirled all in my food processor. 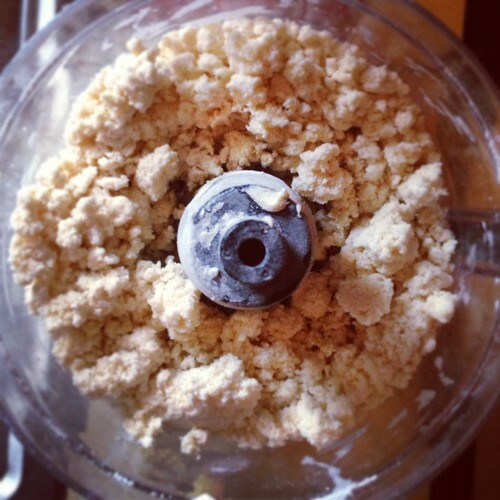 My food processor is on the smaller side so I can only make one dough recipe (ie. enough for one quiche) at a time. But it all came together and BOOM. So easy. After the dough chilled for a few hours, I rolled it out and smushed it in my tart pan. Don’t get me started on the tart pan. Lets just say I was able to find one after vising THREE STORES. You’d think Macy’s would have a tart pan. Nope. And using a pie plate was not as pretty. 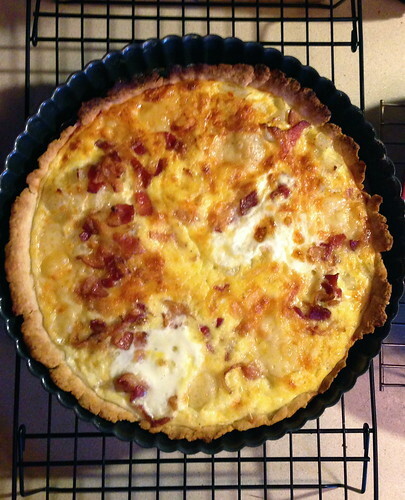 This is the Quiche Lorraine (quiche 1 of 2). Bacon, gruyere, onion, eggs, heavy cream. The other quiche, Gorgonzola-Apple Quiche (not pictured!) had apples, gorgonzola, onions, eggs, and heavy cream. Delightful. Our lovely table scape courtesy of Jes. Birthday brunch at it’s finest. And what’s a brunch without booze? Not a brunch, duh. Jes supplied mimoas and I brought the best bloody mary mix EVER. In my opinion. So, ever. Zing Zang is the BEST. If only we had pickled green beans up here to top it off. Celery will just have to do. 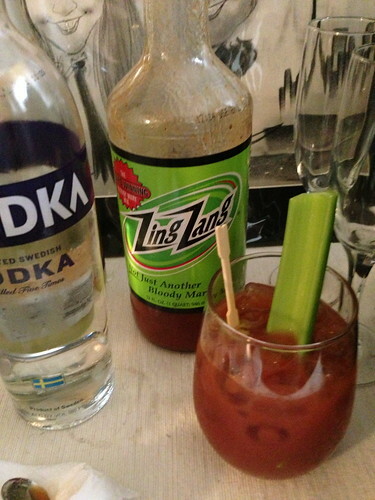 If you are a bloody mary fan, I suggest ditching your mix and get this. You can thank me later. All of us pigged out and enjoyed ourselves. It was a relaxing afternoon for everyone who attended and quite pleasing to the palate. We don’t indulge all the time, but when we do, we do it right. There were leftovers (I know… blasphemy). But, we packed them up and sent them home with Mom. Gram and Pap lucked out since they got to eat the leftovers :). 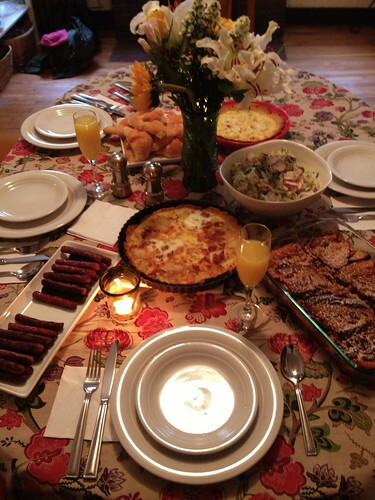 Since I know Mom follows my blog … I HOPE YOU HAD THE BEST BIRTHDAY BRUNCH! 🙂 Can’t wait to plan for next year! Love you! 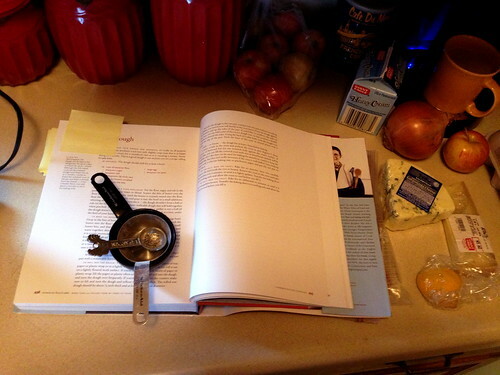 PS – No recipes for the quiches? I know. I’m keeping with the FFwD rule of not posting Dorie’s recipes. Her book is amazing and I really do urge you to buy it. Yes, it’s THAT amazing I’m not posting the recipes. But, if you ask me nicely, I may give it to you. I’ve been on a great hit with Yahoo! Shine recipes. This Melty Monsieur is one of them. Oh man. DELISH. On to the recipe. Place bread in a single layer on a baking sheet; broil 1 1/2 minutes on each side or until lightly toasted. Spread 2 teaspoons of mustard and mayo on each bread slice. 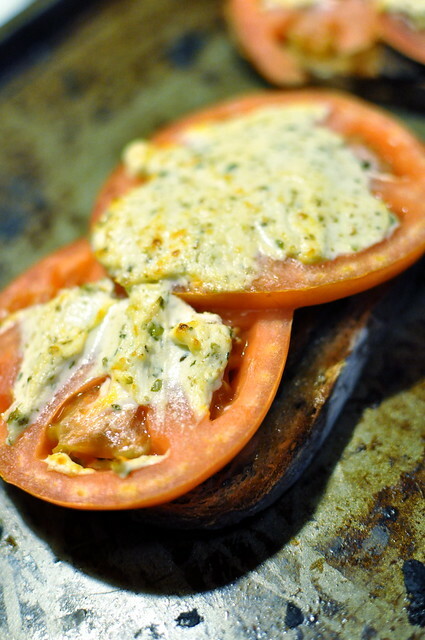 Top each serving with 2 bacon slices, 3 tomato slices, and about 3 tablespoons cheese. Broil 3 minutes or until cheese melts. Talk about easy and quick. 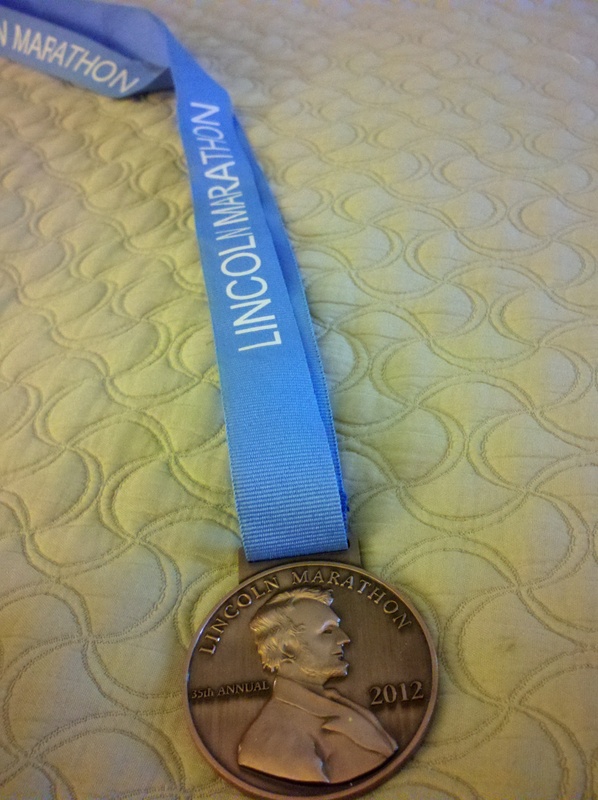 Jules and I just ran half marathons this past Sunday. She did hers in Lincoln while I ran in Pittsburgh. 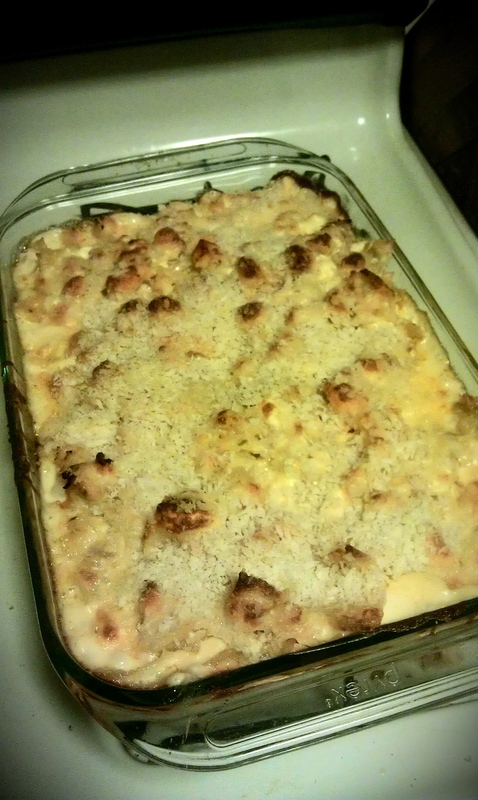 A few weeks prior, one of us stumpled upon How Sweet’s lobster mac recipe. We squealed weith delight in our cubes at work and swore we hated How Sweet because this is just SINFUL to look at. Then we came up with the best idea ever to make it after our 13.1 mile conquer. We went to the Trader Joe’s in the South Hills. I nearly died when i walked in. IT’S LIKE TRIPLE THE SIZE OF THE ONE IN THE CITY. 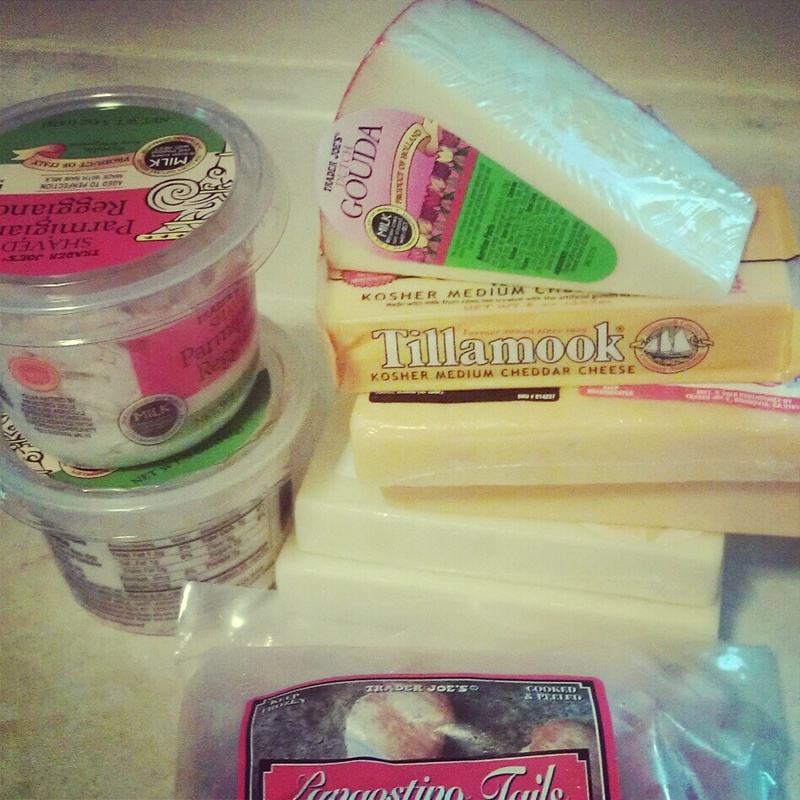 Do we have enough cheese? Ha. Of course not. There was also cream cheese involved (not pictured). 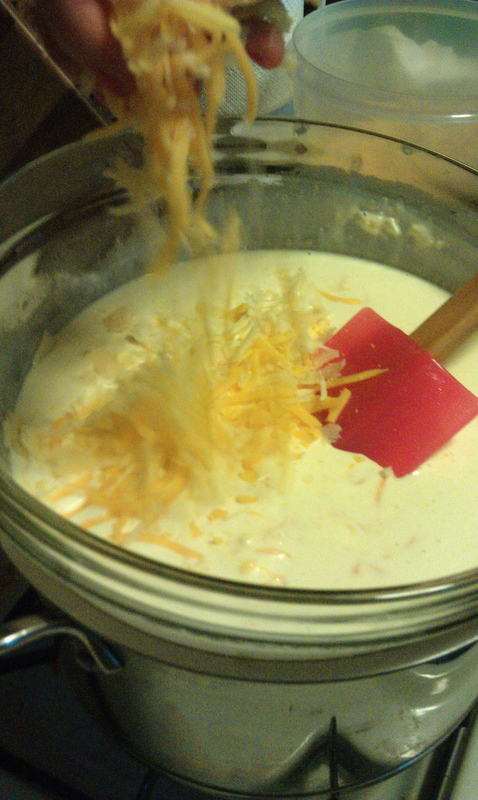 Make some delicious cheese sauce that includes gruyere, cheddar, parmigiano-reggiano, cream cheese, and some heavy whipping cream. Sautee up garlic, shallots, and onions in butter and olive oil for about 7 minutes. 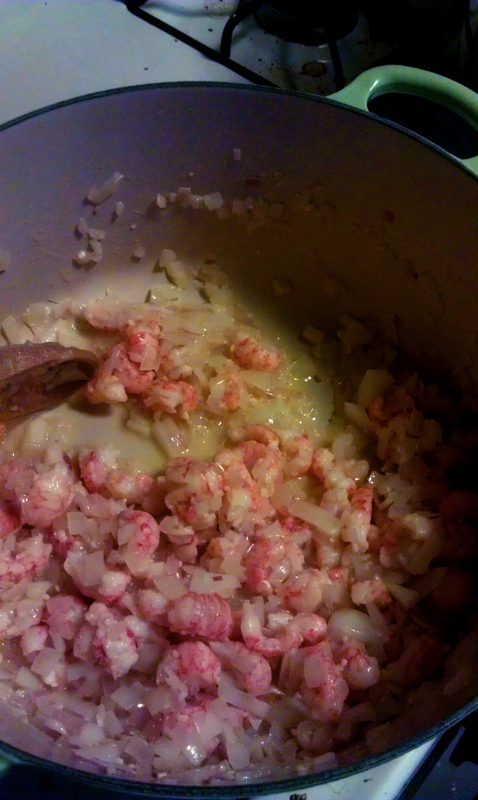 then toss in your langostino tails. Try not to eat it. After a few minutes, toss in some of that white wine you’ve been sipping on. Take your pasta, dump it in a baking dish, pour the cheese sauce over the pasta, dump the onion/lobster medley on top, top with panko, and wait impatiently for a half hour while the already delicious mac bakes at 350 to become even more delicious. No. WAY TO GO JULES (bottom medal) AND EMILY (top medal)!!! I can’t wait to see what we end up eating after we complete or first full marathon. ACK. Sometimes I like to play it simple and safe by stuffing some dough with ingredients and baking it. Like this post. I had some pizza dough from Trader Joe’s in the refrigerator. 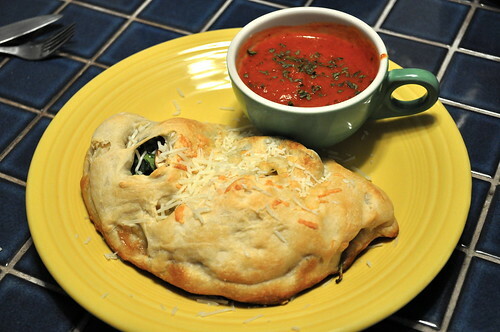 Thinking it’s time to make a calzone, I had spinach, gruyère and mushrooms in my fridge. Bingo! All of those ingredients were stuffed into some of the dough and baked for about 30 minutes at 375, or until crisp and golden brown. It’s the simple things in life that are the yummiest. The complex taste of the gruyère mixing with the spinach and mushrooms makes me feel more of an adult while enjoying a simple calzone. So good! Served with some marinara (shh, or spaghetti sauce!) for dipping. Happy stuffing!